All of the Democratic Congressional appointments have been made to the federal Long Term Care Commission. Neither ADAPT nor NCIL were appointed. It’s extremely doubtful Republicans will appoint us, so we have only one more chance. Will the President appoint representatives from ADAPT and NCIL or will our voices continue to be ignored? 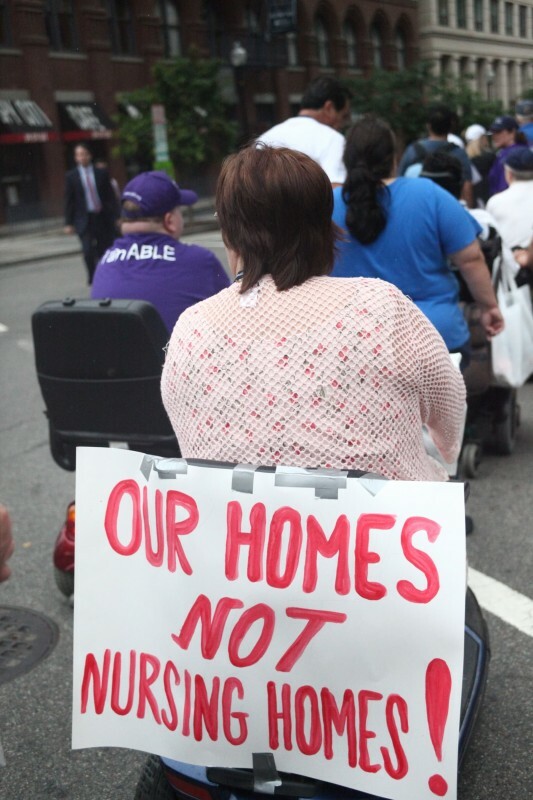 Take Action: Demand that ADAPT and NCIL be appointed to the Commission. Send a message: Nothing About US Without Us! No other national grassroots organization run by people with disabilities has the same history of working on long term services and supports as ADAPT and NCIL. With grassroots networks of people with disabilities from across the country, ADAPT and NCIL are the authentic voice of people with disabilities on these issues. Instead of appointing us, Congressional Democrats have appointed doctors, a union leader, and policy “experts”. Here are the appointments that have been made so far by the Democrats. Dr. Bruce Allen Chernof currently serves as the President and Chief Executive Officer of The SCAN Foundation, with the mission to advance the development of a sustainable continuum of care for seniors. Prior to heading The SCAN Foundation, Dr. Chernof served as the Director and Chief Medical Officer for the Los Angeles County Department of Health Services after serving as the Department’s Senior Medical Director for Clinical Affairs and Affiliations since December 2004. Judith Stein is the founder and Executive Director of the Center for Medicare Advocacy, Inc. Focused on legal representation of the elderly since beginning her legal career in 1975, Stein was the Co-Director of Legal Assistance to Medicare Patients (LAMP) where she managed the first Medicare advocacy program in the country. She has extensive experience in developing and administering Medicare advocacy projects, representing Medicare beneficiaries, producing educational materials, teaching and consulting. She has been lead or co-counsel in numerous federal class action and individual cases challenging improper Medicare policies and denials. George Vrandenburg is a civic activist, philanthropist, and President of the Vrandenburg Foundation. He founded USAgainstAlzheimer’s, a national disease advocacy network, and currently chairs the Geoffrey Beene Foundation-Alzheimer’s Initiative on early diagnosis. Prior to December 2003, Vrandenburg served as a Strategic Advisor at AOL Time Warner, following terms in senior executive positions at AOL, AOL Time Warner, and Time Warner. Before joining AOL, Vrandenburg worked as Senior Vice President and General Counsel of CBS Inc. and Executive Vice President of Fox Inc.
Laphonza Butler is the President of SEIU ULTCW – the United Long Term Care Workers’ Union, which represents in-home attendants and nursing facility workers in California. Judith “Judy” Feder is a Professor of Public Policy at Georgetown University and was Dean of the Georgetown Public Policy Institute from 1999 through 2007; she is a member of the Institute of Medicine. Feder was staff director of the U.S. Bipartisan Commission on Comprehensive Health Care (the Pepper Commission) chaired by Senator John D. Rockefeller IV, which contributed to the health care debate before and during the Clinton administration in the 1990s. She served in that administration as Principal Deputy Assistant Secretary of the Department of Health and Human Services. Javaid Anwar, M.D. is the CEO of Quality Care Consultants, which provides consultant services in health care strategy and policy development for employers and health care organizations. He practices medicine with Internal Medicine Associates and is the Medical Director for Employers Occupational Health, the largest workers compensation insurance company in Nevada. He also serves as the President of the Nevada State Board of Medical Examiners and is a member of Senator Harry Reid’s Select Committee for Candidate Interviews for Armed Services in Las Vegas, Nevada.